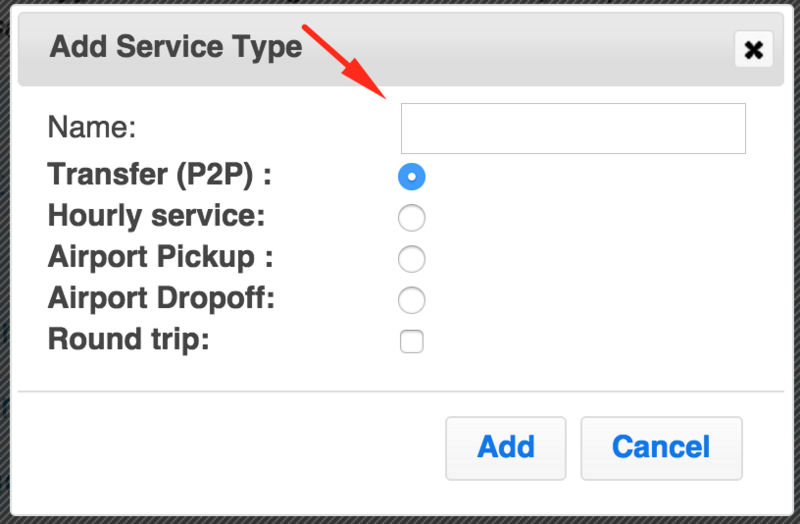 Once you’ve successfully completed Step 1: Adding Vehicle Types, click the next tab to the right marked “Service Types”. On this page you can add all the different service types that your company provides. Use the red plus button located in the top right corner of the page to add a new service type. A window will open for you to input service type information. -Airport Pickup: customer will choose an airport from the airports you service for their pick up address and will be asked for a drop off address. They can also input flight information. -Airport Dropoff: customer is asked for pick up address and can choose an airport for their drop off address. They can also input flight information. -Round trip: Choose this option for any service types that you want to allow customers to request a quote or book for both the initial and return trip at the same time. Once you’ve input all of your service types, you’ll see them listed on your “Service Types” tab as shown below. You can add, move or delete service types from this tab at any time. Use the red trash can button to the right of each service type to delete it. To edit service type information, see our tutorial on Pricing. You can grab and drag your service types to reorder them. The order that they appear on this page will be the order that they appear on your website form. Check the boxes next to the DBA(s) that you want these service types to be offered for. If you have only one DBA, be sure to check all of the boxes. You’ve now successfully added your Service Types. You can now move on to Step 3: Adding Airports.